Julie's Creative Lifestyle: Wordless Wednesday - More Snow in the Forecast! We are expected today a coating to an inch of snow! I will be participating at these great Wordless Wednesday parties! Holy cow, that's a lot of snow! I think it's beautiful, but you can keep it, k? lol I bet you're more ready for spring than even I am. Nice picture! Beautiful picture....but I am sure you are over the snow! It is only pretty for just so long! Have a blessed, warm Thursday! Hi Julie, thank you for stopping by Oh My Heartsie Girl and for sharing the link above, I appreciate it. Everyone is sure looking forward to spring this year!! Pretty but I'm seriously glad we don't have any! I like to visit snow. :) sending warm thoughts your way! We had a white out this morning driving...winds are whipping that snow everywhere here today. 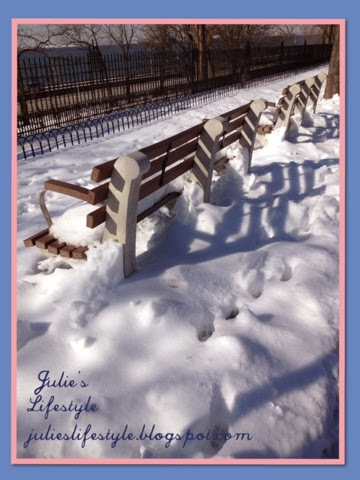 © Julie's Creative Lifestyle: Wordless Wednesday - More Snow in the Forecast!